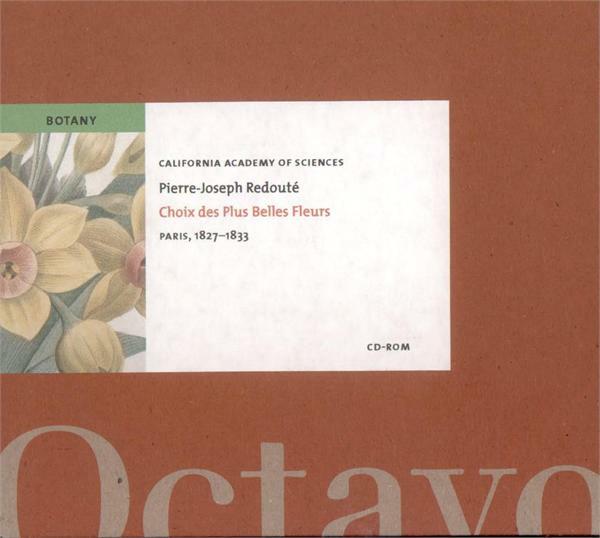 The Choix des Plus Belles Fleurs (Selection of the most beautiful flowers) is the masterpiece of Redouté’s later years. This most celebrated of botanical artists (1759-1840) came from a Belgian family of painters, and served (under various titles) as drawing master to the queens and princesses of France for half a century. Among his pupils were Louise and Marie d’Orléans, to whom the Choix was dedicated: the latter became the first Queen of the Belgians. Over his eighty years, Redouté weathered the many changes in French society with remarkable ease, prospering under old and new regimes by adjusting to the times. The great multivolume folio scientific monographs of his middle period – the roses, the lilies, the succulent plants – were complemented in his later years by elegant quarto albums that featured selections of the more beautiful or striking plants. They were, essentially, art books of the highest quality. The finest of these, theChoix des Plus Belles Fleurs was issued in 36 parts between 1827 and 1833, with 144 superb hand-colored stipple engravings, of fruit as well as flowers. 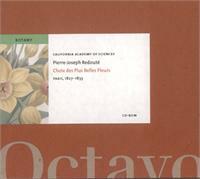 It is notable, too, for its retrospective preface, in which Redouté reflects on his life and achievements. Octavo’s edition is reproduced from a beautiful copy bound in contemporary morocco from the library of the California Academy of Sciences.